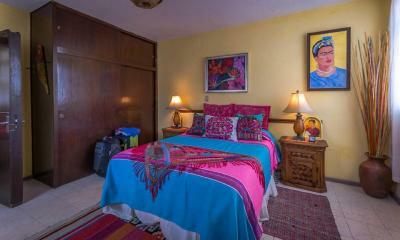 Lock in a great price for Casona Rosa – rated 9 by recent guests! 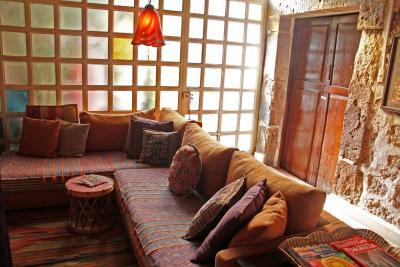 The location was super - just few blocks from the center of the city and the best restaurants, etc. What was especially noteworthy was the excellent, supportive staff. They provided great information as to what to see and where to find things as well as arranging tours, transportation, etc. Breakfasts were excellent. Healthy and delicious. Our large second floor room on the street was great, with very little street noise. The place is funky, full of fun stuff, and eclectic. The location two blocks off the central plaza was wonderful. 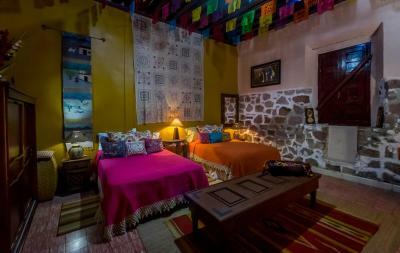 We stayed for 3 nights and then another night after returning from Patzcuaro, and leaving for home. Very colourful, interesting welcoming place. Luppi, the manager is very kind and Rose, though out of the country spoke to us on the phone to make sure we had everything we needed and any questions answered! Leticia was so helpful in discussing things to do. The staff was extremely friendly and courteous. Breakfast was very good. Casona Rosa exceeded all our expectations in every possible way. Location, service, comfort, price. 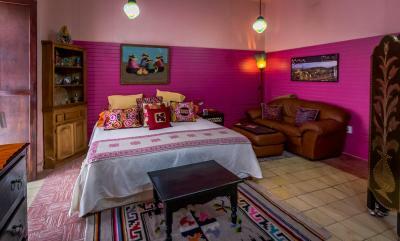 It is a gem of a place located in the centro historico only a short walk to the many attractions available in Morelia. Our only regret is not having more than 2 days to stay in this amazing place. 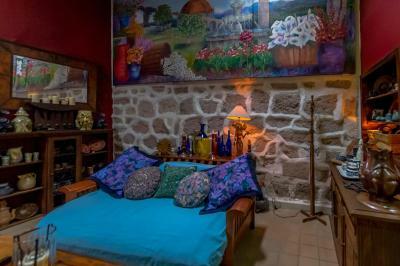 The property is beautiful and unique with great attention to artistic details, clean and comfortable. The staff is very friendly and accommodating. 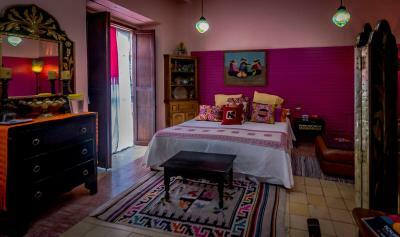 It’s my favorite place to stay in Morelia. Lupe, the manager, was extremely friendly and helpful. Wonderful location and lovely staff, delicious breakfast. Casona Rosa This rating is a reflection of how the property compares to the industry standard when it comes to price, facilities and services available. It's based on a self-evaluation by the property. Use this rating to help choose your stay! 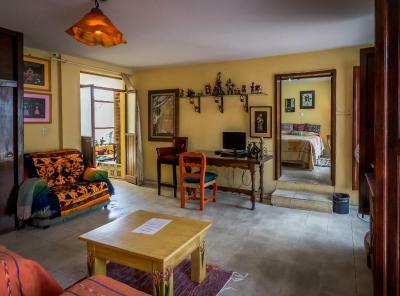 One of our top picks in Morelia.Featuring a terrace and a shared lounge, Casona Rosa is set in Morelia and is 1,000 feet from Museo Casa Natal de Morelos. The property is around 1.2 mi from Guadalupe Sanctuary and 1.5 mi from Morelia Convention Center. 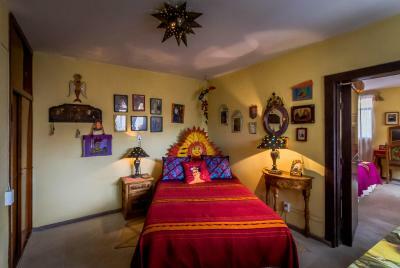 Is located 3.1 mi from Morelos Stadium. At the bed and breakfast, every room includes a patio. Selected rooms also feature a kitchen with a microwave and a toaster. 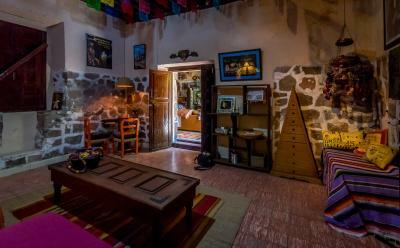 At Casona Rosa, all rooms come with a seating area. The nearest airport is General Francisco J. Mujica International Airport, 15 mi from the property. 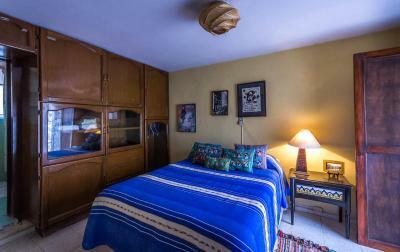 뀐 Located in the real heart of Morelia, this property has an excellent location score of 9.8! 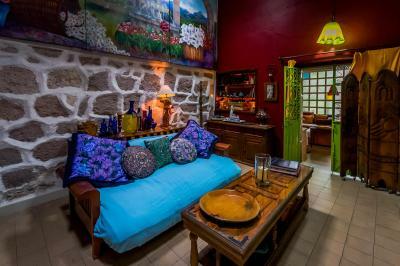 When would you like to stay at Casona Rosa? This suite features a sofa, DVD player and patio. Public parking is available at a location nearby (reservation is needed) and costs MXN 200 per day. Rooms are 36 square yards. This suite is on street side, room has wooden shutters to block out the light during the day and street sounds at night. This suite has a seating area and work desk. House Rules Casona Rosa takes special requests – add in the next step! Casona Rosa accepts these cards and reserves the right to temporarily hold an amount prior to arrival. Please note that the deposit may be made through Square, Pay Pal, Zelle or direct deposit via bank transfer. Pets policy applies just to Suite Confort, and smoking is allowed just outdoor. Please inform Casona Rosa of your expected arrival time in advance. You can use the Special Requests box when booking, or contact the property directly using the contact details in your confirmation. The stairs were dangerous and the bathroom floor very slippery. The noise from the Street was very loud. We needed 4 beds and had a very uncomfortable cot. We were not offered an available room with 4 beds downstairs on the inside where street noise was negligible, although I spoke personally to the owner about what we needed. We felt discriminated against for this. A bit noisy in the evening and early morning in upstairs room . Breakfast was delicious and plentiful . Coffee perfect and available any time. Authentic decor , comfortable bed. Our room was warm and the windows were right on the street--so noisy at night. An overhead fan would have been very welcome. Also, breakfasts were all very similar. Location was perfect and host Rosa was wonderful, helpful and happy to impart relevant information about Michoacan. 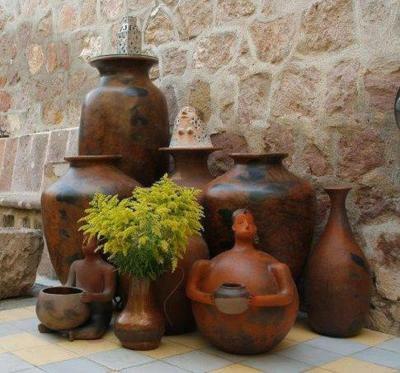 The property is full of beautiful plants and both inside and out was plentiful with artesania from the region. A special shout-out to Lupe, Rosa's on-site helper. And, an added plus, was help with booking of tours before and during our stay. I think the bathrooms could have been better. Had a wonderful time. Staff was great and very polite and always ready to help. Staff were wonderful, location was great, breakfast was good. Interesting hotel. Really great breakfast thanks Lupe.